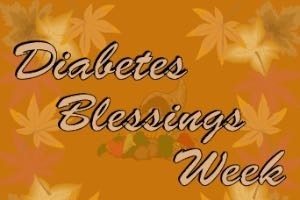 If you aren't suffering from a complication of diabetes, you actually have every reason to be thankful that you have this dreaded disease. Even if you already have some complications, you can reverse most of them. Thanks to ** Leighann Calentine**! In fact, I have been able to reverse two of them: one was a microaneurysm in my left eye, which if I didn't do anything, could have led to my becoming blind in that eye. The other was some diabetic peripheral neuropathy in my feet; the neuropathy has come and gone. Both complications went away when I redoubled my efforts to reduce my blood sugar. We can be thankful for diabetes because at its best it's a wake up call. It doesn't hit us like a ton of bricks, like for example a cancer diagnosis or a stroke. Instead, it gives us a warning that the path we are following leads straight to a cliff. I listened to the wake up call 20 years ago when a doctor told me that I have diabetes. I didn't have a clue that I was at risk, since I hadn't been paying attention to my body, which had grown big and soft. But I immediately lost a lot of weight and started to exercise for the first time in years. While I later gained back a lot of the weight, I lost it permanently starting in 2006. And I was able to bring down my A1C level from 14.4 when I learned that I had diabetes to less than 7.0 within 5 months of my diagnosis. In the 20 years since then it's gone up as high as 7.1 once, and in the past two or three years it's down close to 5.0. We can also be thankful that managing our diabetes is incredibly simple. Having diabetes means that our bodies don't do a good job of using the food we eat because of a disturbance of carbohydrate metabolism caused by essentially complete lack of the body's production of insulin, if you have type 1 diabetes, or by the body's inability to use the insulin that your body produces, if you have type 2. Whether or not you have type 1 or type 2, it is essentially just those carbs that raise our blood sugar levels. People who have type 1 diabetes have to take insulin shots, of course. But all of us manage the disease better when we limit the carbs in our diet, and those people who have type 1 will then need to take less insulin. As simple as managing diabetes is, I know from two decades of struggle that it's not easy. It means constant vigilance over my diet, my weight, and my exercise. But I have also learned through my experience that it is worth the effort. I am much more positive about my life now than I was before my diagnosis. Our health in general improves when we manage our diabetes. What's good for managing diabetes is just as good for managing our entire body. In fact, I usually think that it's better that we don't have a cure for diabetes. If we did, we would undoubtedly slack off on doing what living in a body demands. It's not a coincidence that November is American Diabetes Month. So please be thankful now. If not now, when?